Believe it or not, Thanksgiving is right around the corner, and some folks are already planning their menus. I know! Who are these people? In fact, my post 27 Amazing Desserts for Thanksgiving had over 2,700 views in September. Now that’s planning ahead! If you are a planner and organized enough to be already thinking about what you are going to serve for Thanksgiving, I have the perfect Thanksgiving side dish recipe, Easy Spicy Southern Corn Casserole. 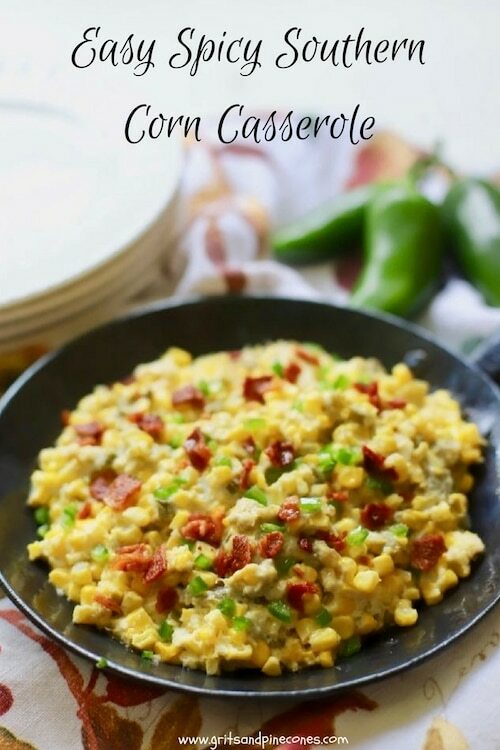 However, if you are like me and not ready to even begin thinking about Thanksgiving yet, this easy corn casserole is also perfect for a quick weeknight dinner with your family or a special dinner with guests. 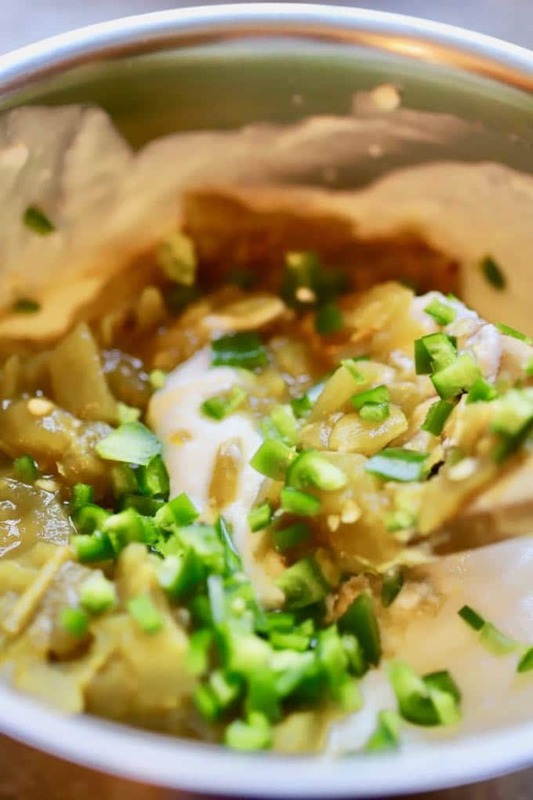 It is also the perfect dish to take to a pot-luck dinner! It’s actually the best corn casserole I’ve ever tasted, and that’s saying a lot because I’ve never met a corn casserole that I didn’t love! A friend of ours Leigh Ansley brought this delicious and spicy hot corn casserole to a supper club dinner and was sweet enough to share the recipe with me. Her original recipe served twelve so I I’ve changed it up just a bit and have been making it ever since. You won’t believe how easy this corn casserole is to make and I know you, and your family and guests will love it as much as we do. 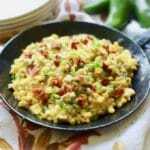 If you are a corn lover like me, you might also like these recipes that feature fresh corn: Southern Shrimp and Corn Fritters, Southern Creamed Corn, and Corn Tomato and Avocado Salad. 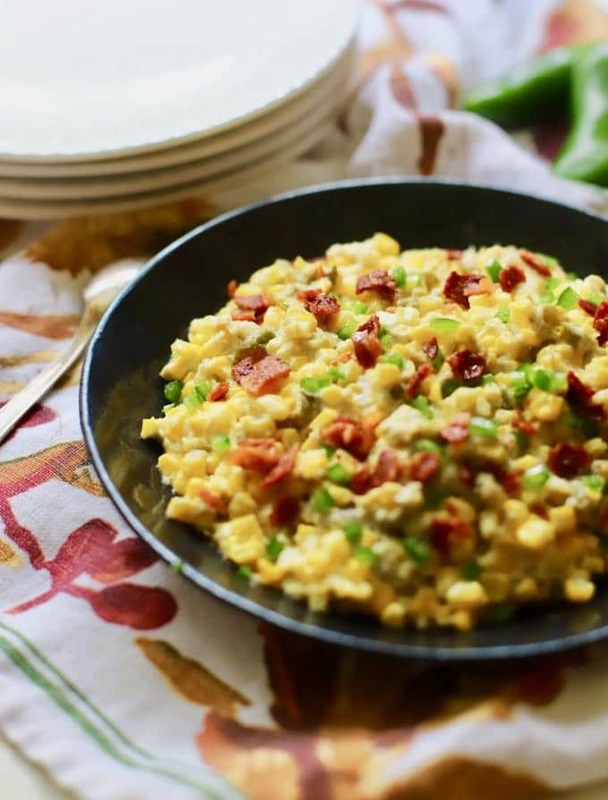 This Easy Spicy Southern Corn Casserole recipe is also extremely versatile, and you can use any type of corn you have on hand. I usually try to use fresh corn when it’s in season, but you can also substitute frozen or even canned corn. 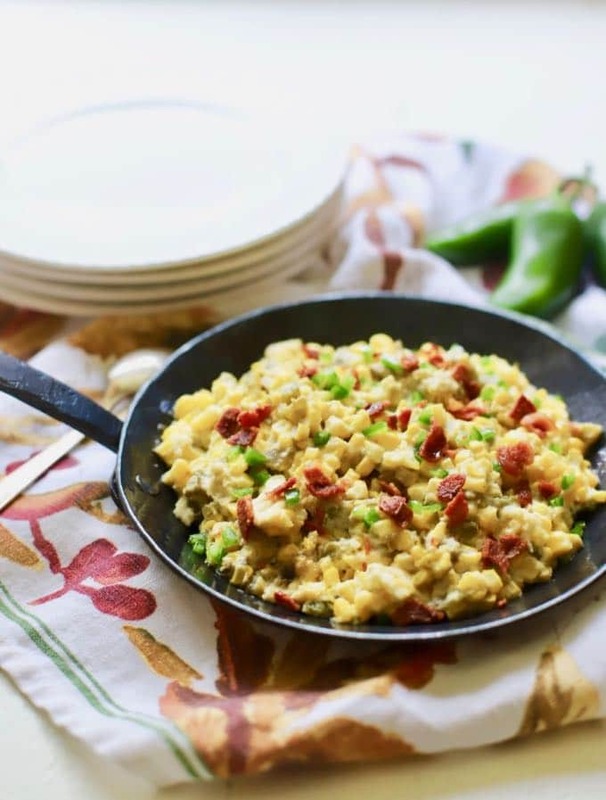 The only other ingredients for this easy corn casserole recipe are cream cheese, milk, canned chilies, butter, bacon, and jalapeno peppers. 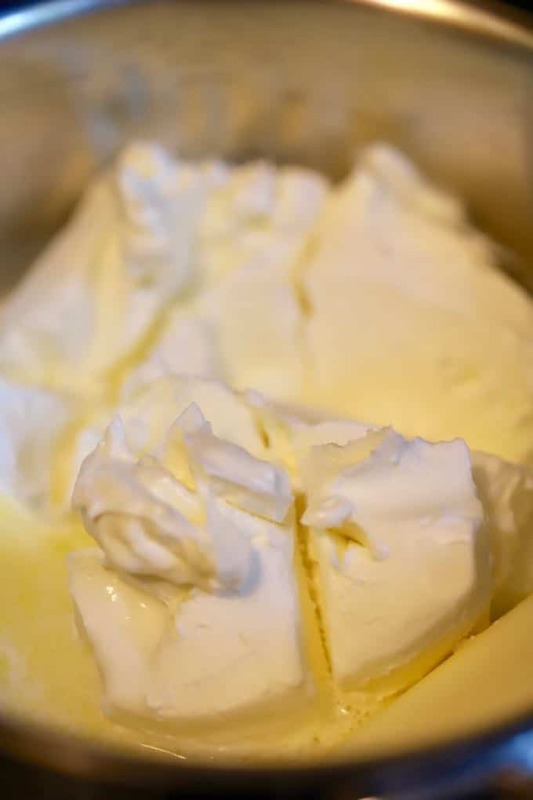 Combine the milk, butter and cream cheese in a small saucepan over low heat. Stir constantly until the butter and cream cheese have melted and the mixture is smooth. Remove from heat. Spray a small 8-inch square or round casserole dish with non-stick cooking spray or grease it with butter. Add the corn mixture. **Sharing with Meal Plan Monday! 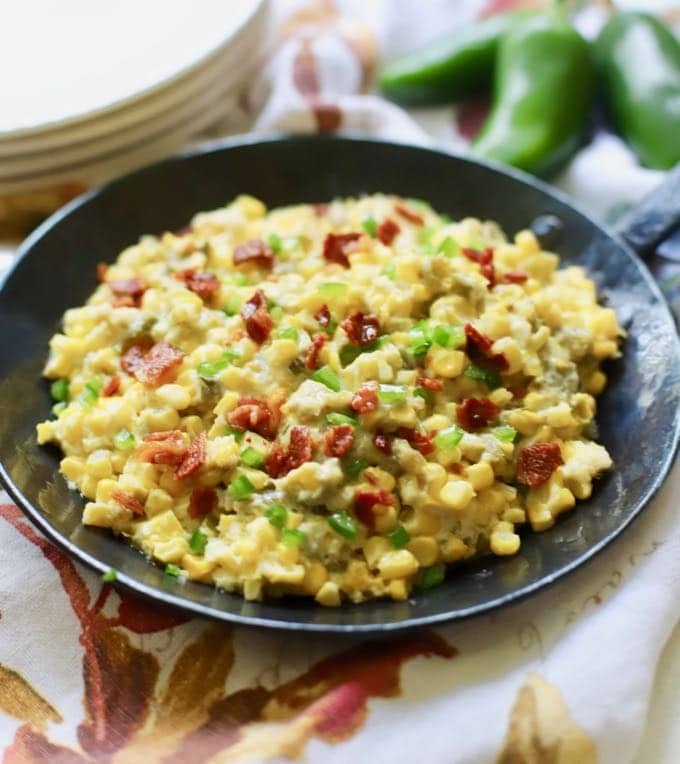 Easy Spicy Southern Corn Casserole is a perfect side dish and a fiesta for the senses with luscious corn, chilies, jalapenos, bacon, and decadent cream cheese. 4 cups cups fresh corn kernels or about 5 ears of fresh corn. 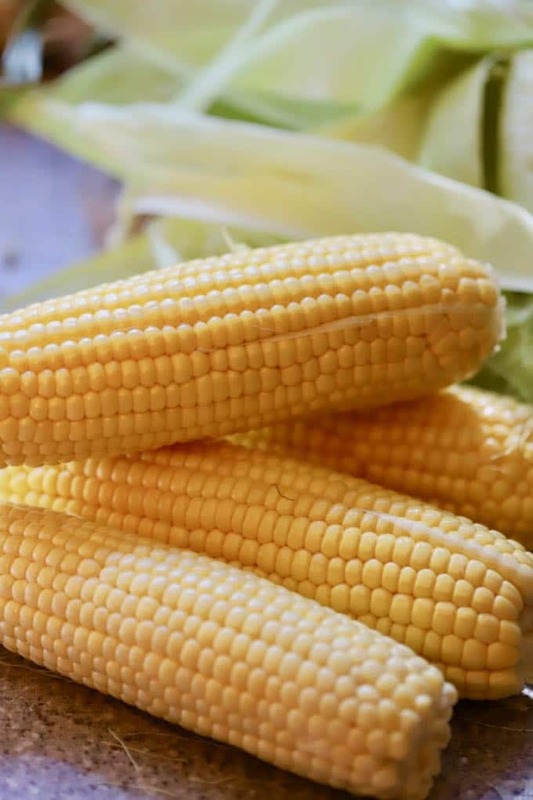 You can substitute an 18 oz package of frozen corn or two 15 oz cans of yellow or white corn, drained. Spray a small casserole dish with non-stick cooking spray or grease it with butter. Add the corn mixture. You had me at jalapeno and bacon. This looks like true comfort food and a great dish to bring to a potluck. Thanks Jenni, yes you are right about the jalapeno and bacon, how can anything be bad with those ingredients?